Saudi crown Prince Mohammed bin Salman (MBS) promised cooperation in combating terrorism, stating India and Saudi Arabia agreed on the need to put pressure on countries that back terror while also offering to share intelligence with India. 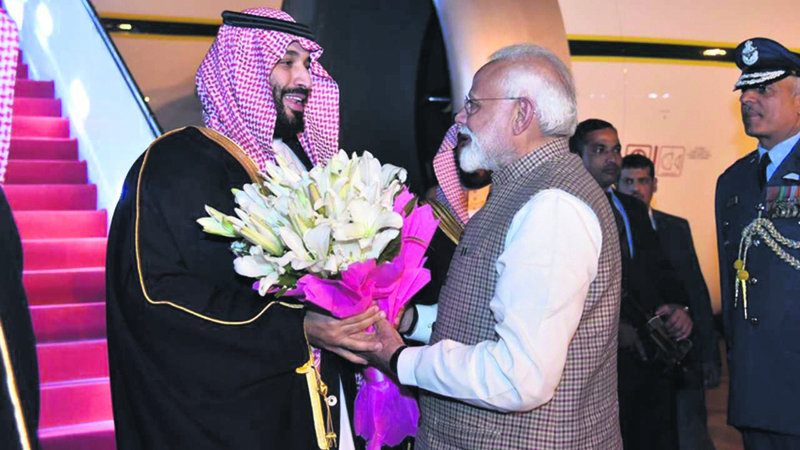 During his discussions with Prime Minister Narendra Modi, MBS said, “As far as terrorism and extremism are concerned, which are common concerns, I want to tell India that we will extend all cooperation to you, be it intelligence-sharing... Not only with India but also with the neighbouring countries.” His remarks came two days after a Saudi Arabia and Pakistan Joint Statement said there should not be “politicisation” of terror lists. In an interview, Saudi deputy Foreign Minister Adel Al-Jubeir indicated the Saudi-Pakistan joint statement not be read in reference to Jaish-e-Muhammed leader Masood Azhar. “Our policy on listing individuals is very clear. If someone is engaged in terrorism, if someone belongs to a terror organisation that is responsible for murdering people... and if you can't capture that person, he or she has to be designated so that they cannot roam the world freely,” he said.